This entry was posted on 26th February 2015 by dare hannah. It's coming back into spring greens season and I love them all! Although we get local veg throughout the year, it's always a breath of fresh air when we start getting the local spring greens back in abundance. 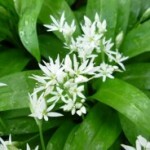 The hedgerows are starting to sprout and wild garlic is on its way. If you aren't lucky enough to live near wild garlic, you most probably have some garlic chives growing in a hedge nearby. You will recognise them by their long thin green leaves which are attached to a small white bulb growing just under the surface of the ground. They also have very pretty edible white flowers which look like a white blue bell. These are growing wild in abundance around West Cork and are fantastic in lots of dishes you would use chives in. 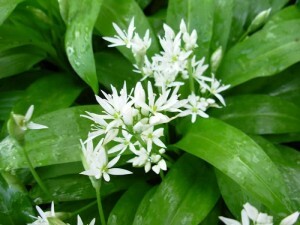 You can always google wild garlic/garlic chives if you want to know the difference between them. I'm at my most creative when given a box of random vegetables and herbs and asked to come up with a dish! So, I love making pesto as it's a great way to make use of excess greens, herbs and even broccoli if you have too much, and a good pesto can jazz up anything from sandwiches, to soup toppings, salad dressing, pasta dishes and more. You can make pesto from so many different ingredients and there are no strict rules for which herb, cheese or nut you use. Play around with different combinations and use what you have in the fridge rather than going out and buying something especially. I love the way pesto packs a serious flavour punch, lasts well in the fridge and can even be frozen if needed. Cut the broccoli into small florets, place in a bowl and pour over boiling water. Leave for thirty seconds, drain and tip into a bowl of cold water, then tip onto a clean tea towel to get rid of excess water. Put all the ingredients into a food processor except for the cheese and oil, blitz until roughly broken up, then add the oil while the motor is running. When you’ve got a nice rough consistency, turn it off, pour it out and fold in the cheese. Taste and adjust the seasoning. Blend half the oil (75ml) with the nuts, parsley and garlic chives, then add the salt, garlic clove (if using) and with the motor running pour in the rest of the oil. Keep blending until you break down the garlic chive (it takes a bit longer than with basil), taste and stop blending when you like the consistancy, pour into a bowl and fold in the cheese (you can use any hard cheese but I love the combination of garlic and pecorino). Check seasoning and enjoy. First remove the stems are taken off the spinach and kale. Blitz the nuts quickly in the food processor, then add the greens and blend with half the oil and the garlic. With the motor running, add the rest of the oil and the salt and blend until you have your desired consistency. Pour into a bowl and fold in the cheese. Check seasoning and enjoy.